Need the flexibility and control to manage large-scale deployments? Private colocation suites are available in the Phoenix market. Interested in more information or a tour of our PHOENIX data centers? Low cost of power, favorable taxes and a slim chance of natural disaster make Phoenix the ideal location for colocation. Secure, stable, affordable and providing high connectivity, INAP’s Phoenix data centers are the perfect home for a disaster recovery environment. 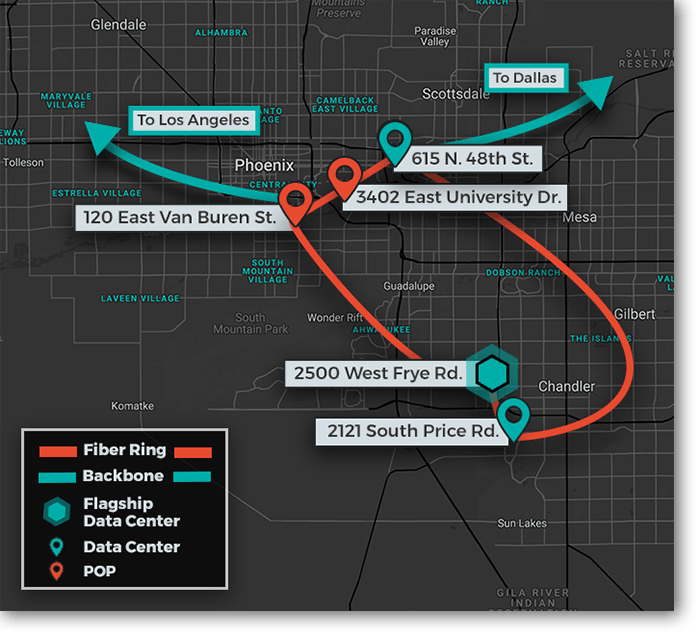 Our Phoenix data centers connect to Dallas and Los Angeles via our reliable, high-performing backbone.